You might come across a time when you have to change a lock on a door. 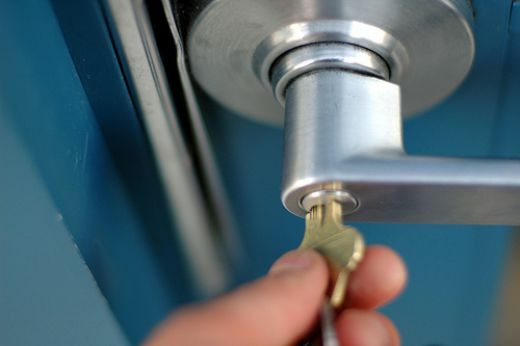 In case your lock is broken, you lost your keys or are facing some security threat, then you need to have your lock changed. Spending a lot of money by calling a professional is not required if you follow some simple guidelines, you can easily do it yourself. You will need just a few minutes and a little experience in order to carry out this task. You need to buy a new lock similar to the old one. Visit your local hardware store and buy a similar lock so you won’t face difficulty in replacing it. Now you should remove the old lock from the door. You are required to unscrew all the screws which hold the lock with the door. When you accomplish your task of taking out the old lock, you can place the new one in the space. You are required to place the lock bolt from the edge of the door. It should be placed in the right position. Next you need to attach the screws on the lock bolt parts which are located on the lock bolt mechanism plate. You can do this with help of a screwdriver. When you are attaching the screws, you need to check that the plate is properly aligned with the door. After attaching the screws on the lock bolt parts, you need to place the outer side of the lock in the hole. It is best to insert this from the outside of the door. Next, place the casing on the outer side of the lock and then insert the cylinder in the hole. Remember that the cylinder should go in smoothly and this can only happen if it is properly aligned. Now attach the back cover of the lock and make sure the latch is pointing up. After joining the back cover, insert the screws and tighten them slightly with help of your fingers. Then tighten the screws properly with the screwdriver. In the end, check whether the lock is pulled together in the right way or not. Make sure that you check it with door open and closed.